You do kind of have flight attendant vibe going on with this look, but not in a cheesy way at all! In a polished, retro-glam Christina Ricci in Pan Am way. You look great! I feel the same way about lipstick, frightening and it always feels high maintenance. Lame but true, as for the ponytail, well I wish I were more afraid of that bad boy. Sometimes I wonder why I bother to do my hair when it just ends up, well, up. Red lipstick frightens me too! I stick to lip gloss. :) You look beautiful in your ponytail and scarf too! See, not so scary after all! That second picture is so cute. Your smile looks great with lipstick!! so, i think the ponytail is cute...and it doesn't bring the outfit down at all. i wonder if tying that scarf just a touch differently would help you feel confident in them. i never like my scarf til i get the knot and tails just right. there are so many awesome tutorials out there. if i run across another one--i'll shoot it to you. i think longer scarves help too, cuz you can bunch them a lot before you tie, or you can wrap them several times and then knot them. :) i love scarves with any outfit and i'm always working to improve my tying of them. I REALLY love this outfit. It's very classy! 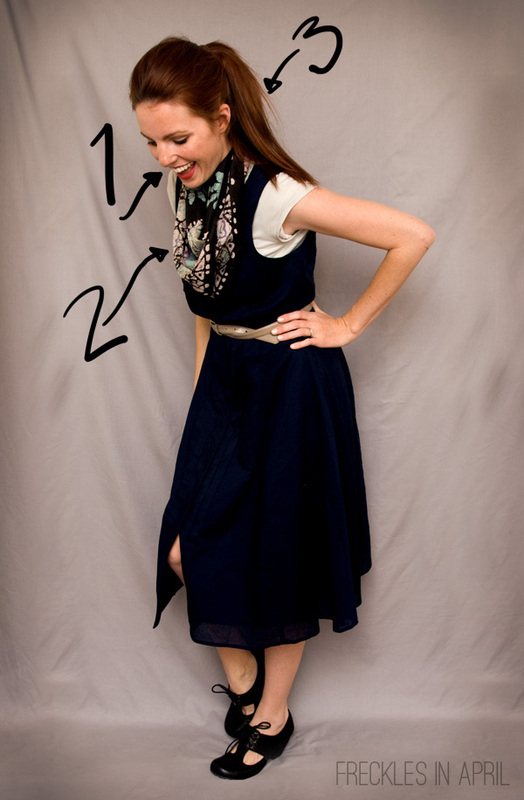 And I feel the same way about scarves - I'm always at a loss at how to wear them. But you should rock them and red lipstick much more. They look fabulous! Funny, I had to think long and hard about what scares me too. Then realized I don't buy the kinds of clothes that scare me (short skirts, tight pants, sleeveless tops). I have something that will do and will post it soon. LOVE those shoes. I used to be kinda scared of lipstick until I found out 'tinted lip balm' exists. (I get the Covergirl NatureLuxe kind) and it's great because it lets a little of your natural color show through, so you can't pick a color that is TOTALLY wrong for you. I love this outfit! My husband digs ponytails too. I don't really understand it, but oh well :) I think you look great in one. And you don't look like a flight attendant. Sorry I've been a slacker for you challenge. I've been wanting to join but I'm in the middle of my own fashion challenge... dressing the bump with out any maternity clothes yet. My belly gets bigger and my closet keeps shrinking. Haha! It's been tons of fun to follow! Goodness, maternity pants would have been perfect for the "scary stuff" challenge! What a beautiful classic outfit. I love the scarf and especially the shoes with that dress. You're hilarious, and I totally catch the flight attendant vibe (but you still look fantastic). I think it might actually be more the white shirt under the dress than the scarf. Maybe you could try it again with a cardigan or something, and see if you feel less likely to demonstrate seat-belt buckling. I think you look so good in all 3! The scarf is really cute and I think the red lips suit you! Nice job combining 3 fears into this! The red lipstick looks GREAT on you!!! I'd 'stick' with it! :-) Thanks for letting Outfit31 be a part of the Challenge! I had a great time! You are GORGEOUS! I love the lipstick. I love the scarf. I love, love those shoes. This is one of my favorite outfits! Love the whole outfit, and the hair too! The scarf looks great with that dress. Way to combine 3 fears in one outfit. I think you look great, not awkward! I used to be afraid of lipstick too. I wear lipstick now, but I'm still a little afraid of bright red. You do not look anything like a flight attendent! Haha. The lip color looks great on you! Another good prompt! At first I almost exempted myself from it because I thought I'd pretty much conquered all my closet fears via these challenges in the past. But then I remembered a couple. And you reminded me that I totally have the same hang-up about ponytails. I don't think it looks blah on you at all - and I love the scarf with this outfit too. It's such a good thing to have reasons like this to push ourselves to try something new. When I wear lipstick, I often put some gloss overtop so it looks more current. It totally took me a while to find something that scared, me. And it ended up being white pants. You look beautiful with your hair in a pony! Embrace it! I also love all the red lipstick (yours included) that I've seen today. Thank you so much for hosting this challenge! I had a lot of fun with it and appreciate the thoughtfulness of your choices and inspiration posts. I also think that you look great in a ponytail - rocking it with style. 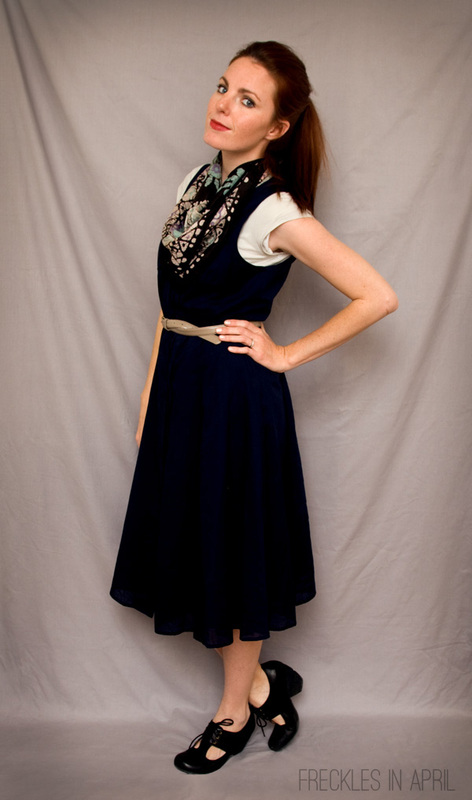 You do not look like a flight attendant, but instead a stylish woman with a scarf. And the lipstick is pretty too! i like the easy going and effortless style of your "scares me" outfit. also thank you for doing this challenge. it has been LOTS of fun to look into my closet a different way. Fantastic outfit! Are you over your fears? As you look great! you look super cute! thanks for this challenge. this was a tough one! I just found your blog and I am so excited to do the next challenge. So creative and fun! Just wanted to let you know that I'm missin' the 10 day challenge!!! Your outfit is super cute. I would for sure sport it. And those shoes are to die for! LOVE this look on you, Kayla - I have a similar black dress I haven't worn in ages, you've inspired me with a new way to wear it. You're now pinned on my Pinterest board! !